PCBC W1 incredibly excited after winning the Novice Wo.8+ division of Bedford Regatta. Photo: Callum Mantell. 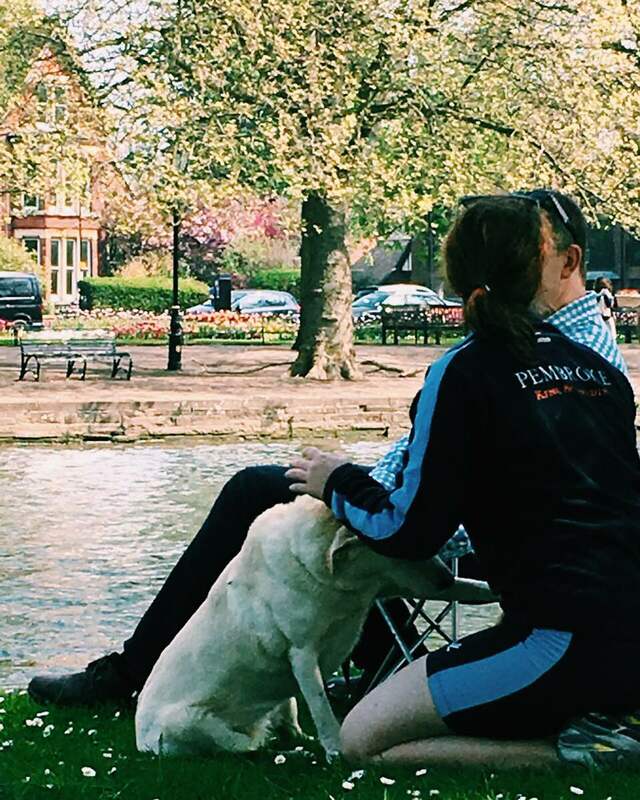 Here follows Courtney Landers’s sixth part of her diary about how she and her team mates in Pembroke College BC’s W1 prepare for May Bumps on the River Cam. I said last week that we’d had a long but exciting weekend, and this week I’ve recovered enough to explain why – PCBC W1 went to Bedford Amateur Regatta. Bedford was a completely new experience for me. For starters, it was going to be a much longer day of racing than what I was used to. Most on-Cam Regattas are Head races, and because of the small number of entrants even side-by-side races like our Pembroke Regatta don’t last more than a few hours; so short that crews don’t normally return to their boat houses between divisions. I raced at a small regatta in Sudbury with a Cantabrigian eight last summer, but we were knocked out quickly and I headed home early. Were we to do well in just one of the two divisions we had entered at Bedford, we could be racing up to four times over the course of the day, with the first race at 9 a.m. and the last around 7 p.m. Plus we had to leave college at around 6:30 a.m. in order to arrive with time to rig the boat and warm up. The course itself also presented new challenges. Just to get on the water we had to navigate a maze of obstacles. At WEHoRR we had boated from Sons of the Thames, where there were only a relatively small number of boats and trailers, and no need to queue to boat. At Bedford, there were boats and crews everywhere, and the queue was so long that we practiced boating rapidly for the entire week beforehand. Once on the water, there was more to get used to. Although the 1,200m distance was barely longer than the 1,100m we race over for Pembroke Regatta, the Bedford course also included the novelty of stake boats, buoy-marked racing lanes, and a rather low, narrow bridge to race through. Focussed and relaxed on our way to marshalling. Photo: Callum Mantell. 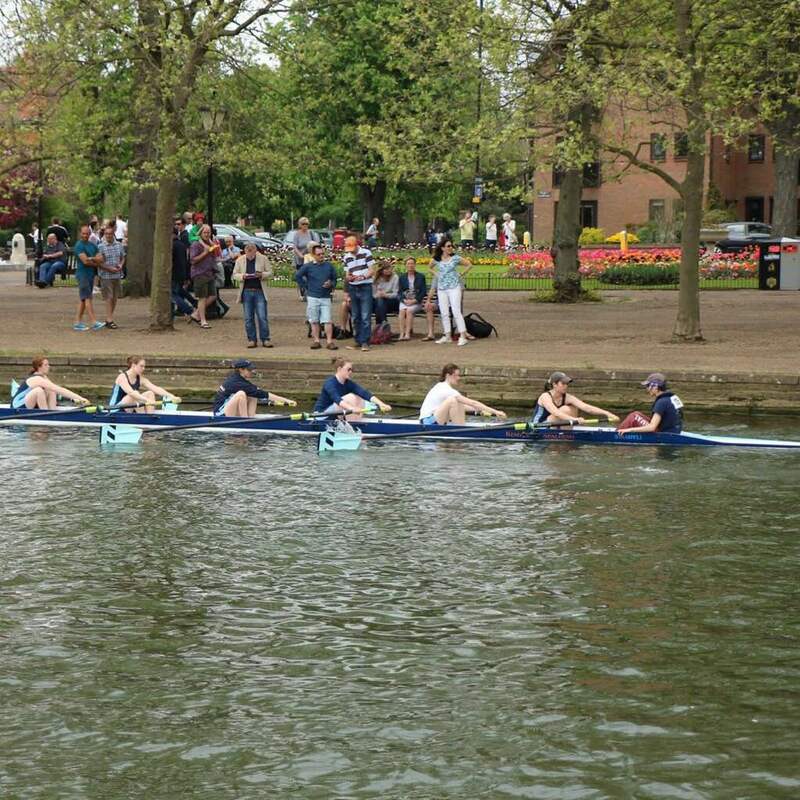 Our first race was against fellow Cambridge college Corpus Christi in the Novice division, starting ‘down’ because of the curve of the river. I finally understood why our coaches put such an emphasis on relaxing before races – with all the novelty and adrenalin I must have forgotten to breathe during the start, and by the end of the race I could no longer feel my face, let alone my legs. 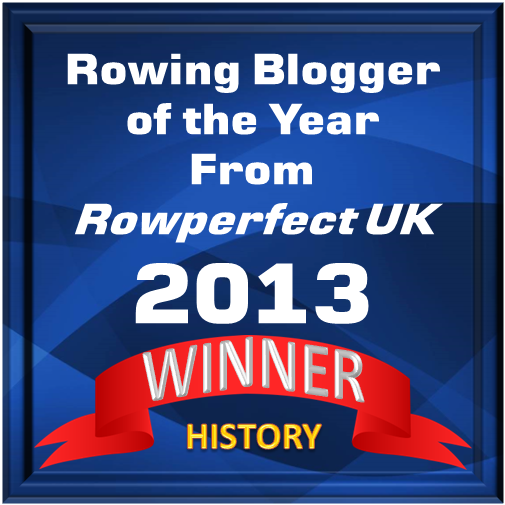 Nevertheless , we beat Corpus by just over a length. Our captain James had also entered us into the IM3 division to ensure that we had at least two races if things were to go badly, so immediately after our race with Corpus, we spun and proceeded straight back to the start to race against Magdalen, Oxford. Despite their reputation (and their fabulous leggings), we were feeling fairly confident, but alas, at around the halfway point our bowsiders’ blades and riggers encountered no less than three swans, scuppering our chances. Retreating to the banks to wait for our second Novice division race, we had time to enjoy the spectacle of the regatta. There were some incredibly strong eights and fours in attendance. On the other hand, there were also octos – I’ve only ever seen one octo on the cam at a time, and I’ve never seen them racing. For one of our crew members, the crowds of spectators brought with them a very welcome distraction. 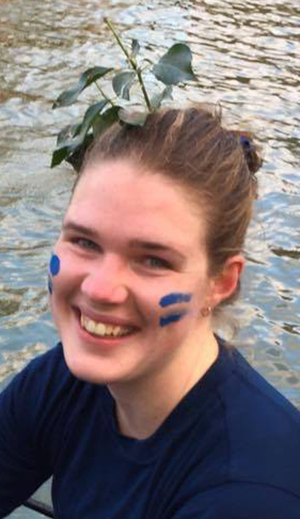 Neria is a second year Human Social and Political Science student from Canada, who in addition to rowing also plays polo for the university. She is the only person I know who successfully maintains a vegan diet while still being incredibly active; as a result, she is an amazing cook. Last year, Neria sat behind me in the 5 seat of our second women’s boat, and though I do miss her now, her current position in 3 seat seems to suit her well. Neria and I in PCBC W2 after bumping on the final day of Mays last year. She’s saying ‘hi’ to her Mum in Canada via CamFm, I’m eating a lolly. Photo: Bjoern A. Zeeb. Though ducklings are unlikely to turn her head, Neria is prone to getting distracted by dogs. She has particular favourites amongst the dogs regularly walked along the towpath, some of which she adores so much, I swear the only thing stopping her from jumping out of the boat to say hello is the awful water quality of the Cam. So with many, many dogs in attendance with spectators at Bedford, Neria was in absolute heaven. Neria making friends with Labrador Scout. Owners name Unknown. Photo: CL, with an iPhone 6 and VSCO. As it turns out, it was a very long day of racing. We progressed through the Novice division, beating Bedford Girls’ School and Sir William Borlase’s Grammar School to make it to the finals against Warwick University. Along the way we discovered that giving your opposition three cheers at the end of the race must be a uniquely Cambridge tradition, because we got some pretty puzzled looks. By the time the final began it was 7 p.m. We were tired, we were sore, and we were a little bit sunburnt. And yet, we pulled off some of the best rowing of the term, confirming my suspicion that this crew rows really well when tired and thus past the point of overthinking and tensing up. And we won! 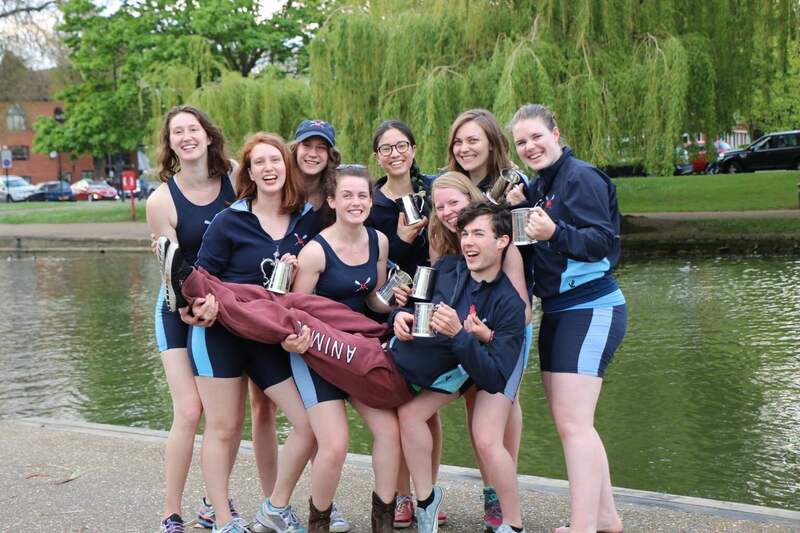 We left with shiny pewter tankards, two British Rowing points each and a new sense of solidarity and confidence. Having such a positive weekend was a huge boost going into this week’s training, since it was scheduled to be a ‘hard week’. A series of long, high rate pieces and short sprints, a Fartlek session and a 7x500m piece left us all feeling pretty fatigued by our off day on Sunday. We were lucky enough to end the week with a formal dinner for the first men’s and women’s boats, hosted by the current Master of Pembroke, Lord Chris Smith. This dinner is a Mays term tradition started by recently retired Master, Sir Richard Dearlove, who was and is a very keen supporter of the boat club. 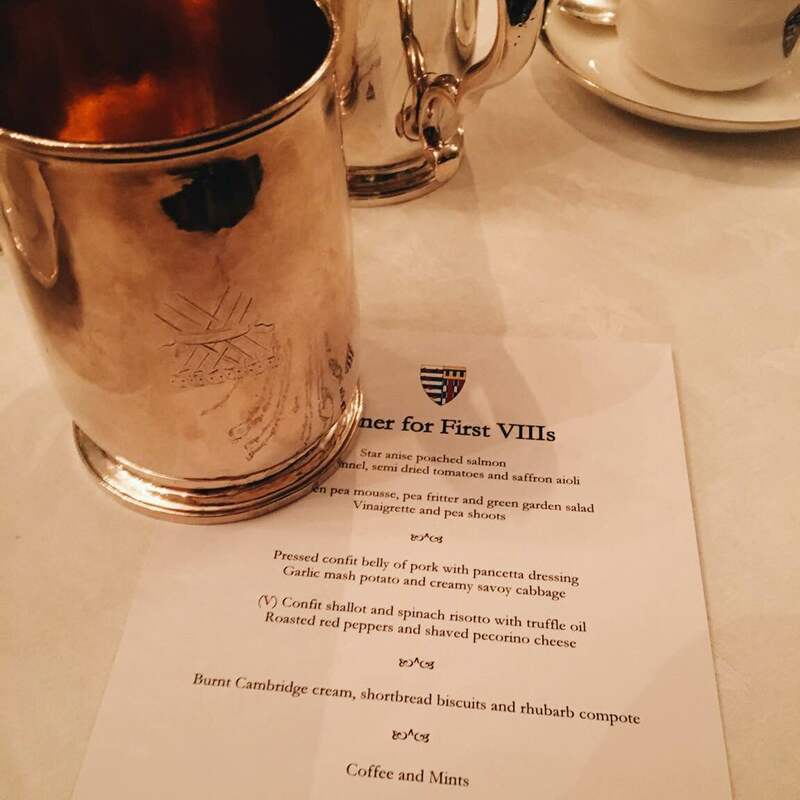 Lord Smith decided to continue the tradition, and made us feel very welcome; we were allowed to use some of the College’s fine silver, including heavy silver tankards. Thus our week started and finished with appropriately filled pots. The menu for our black tie dinner with Master of Pembroke, Lord Chris Smith, and the tankard I was allowed to drink from. Photo: CL, with an iPhone 6 and VSCO. 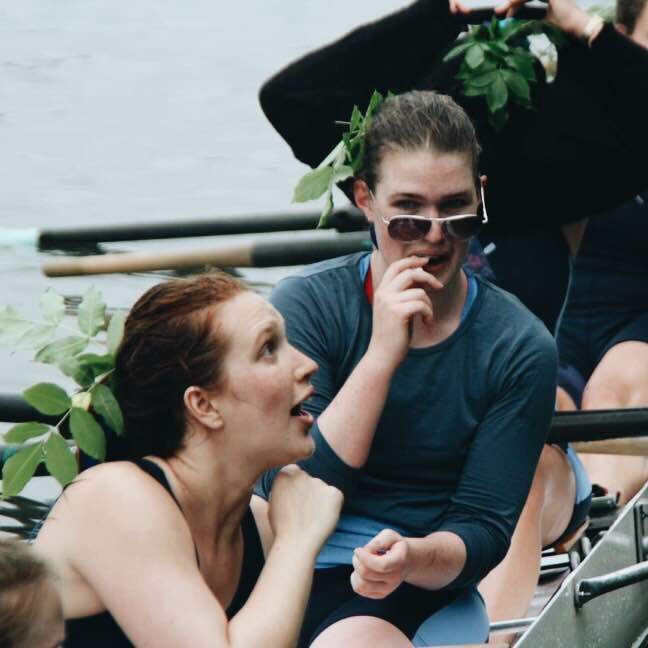 I am thoroughly enjoying this series and would like to assure Courtney that cheering one’s opposition after a race is most certainly not a purely Cambridge tradition but rather is one that I would normally expect to hear at pretty well every regatta up and down the country. Excellent! I did wonder about the cheering, good to know we weren’t just being overbearingly Cambridge. Oxford = Magdalen. Cambridge = Magdalene. Thankyou Nosey, I did wonder about that! Are they both pronounced the same? Thank you ‘Nosey’ for the correction. The article has now been altered to reflect Nosey’s comment.